a²(w): I'm in love, I'm in love, and I don't care who knows it! Sometimes you shouldn't sew. Like when you have a headache. Or are too hot. Or after 9 pm. Wait, is that just me? But sometimes you just NEED to finish a project! This bag came together fairly easily, with a few setbacks (mostly due to being tired). I finished this bag at 11pm last night. I think it is my favorite thing I have ever made! The zipper took an extra hour because I was unhappy with how straight my stitching lines were or if the stitches were slightly uneven. I'm picky! Around 10pm I decided to push through to the handles, which I was sewing past my bedtime, also caused me some angst. This had to do with the directions. I read them like 5 times and still have no clue what I was supposed to do with the batting. I had to cut 4 pieces, but the directions only tell you to use 2. I tried to figure out on my own and ended up scrapping a handle and re-cutting a new one. So they aren't as puffy as they maybe should be, but they suit me just fine. * I say f*** bias tape! I cut 4" pieces on the cross grain, then folded it in fourths to get 1" wide strips for the sides. I sewed the pocket flaps RST, but that means that you lose 1/2" in width, so you need to compensate by making the template 1/4" bigger around the curve. * I used 1" D rings on the sides instead of full circle rings, which means that the straps that go to it needed to be longer. I used a 3" length and a 5" length because I only realized this afterwards, but I think 2 - 4" pieces for each side would be better. * I bought a 24" metal zipper, but after rounding the sides of the front top panels the zipper part ended up being about 2" too long. If you leave the corners square then you need the full 24". * I used a double layer of Peltex for the bottom instead of template plastic. Bad: The lack of diagrams was a bit annoying. The pattern is 8 pages of TEXT long with only 1 diagram to show how to cut the pieces. I'm used to tutorials that have pictures for almost every step! If you are not familiar with bag construction I think this might be a fairly difficult pattern to get through. 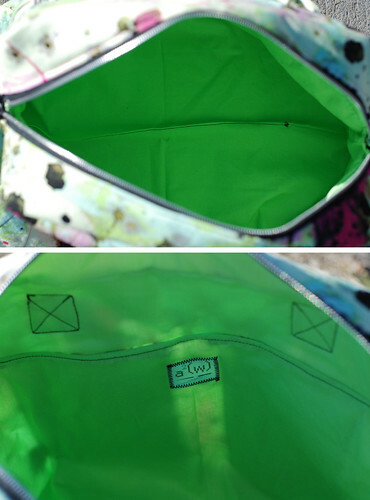 Also, 1/4" seam allowances seem a bit scant in some areas, especially for a bag that you want to be durable. And the missing information about the batting for the handles was annoying (but I think it was just magnified because I was tired). Good: There were a lot of things that I thought were clever. I'm glad that I bought the pattern because I definitely learned some tricks to use on other bags. The pieces are all variations of rectangles, so there aren't fussy pattern pieces to trace. 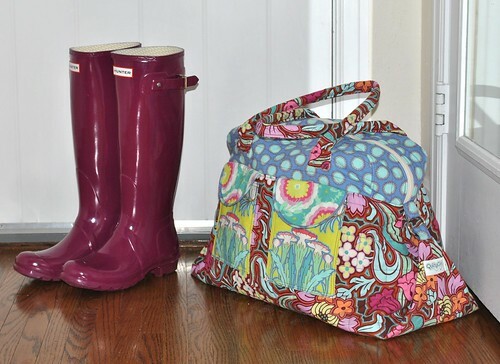 Overall I would say BUY if you want to make a large weekend bag. Your new bag is adorable! I just love Jay McCarroll's Habitat line. It turned out great! I love the fabric, and you are too cute modeling your new bag! Awesome bag! I'm not a fan of Amy Butler patterns either, probably because I'm a male and she tends to be pink and very flowery. And not much of what she does is for men. But I do love a lot of her fabrics. But the Jay McCarroll fabrics are by far some of my favorite of ALL TIME. Dude, paint spattered fabric?! Can it get any cooler than that? Well, maybe if it were black. Anyway, I love your post, and great blog. I could not imagine making a bag using a text-only pattern. Looks like you did a great job with yours!